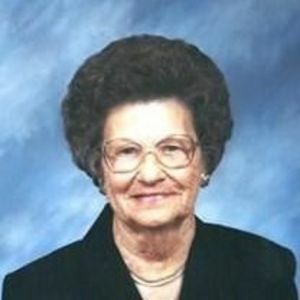 Nell Wallace Mosely, age 95, of Wilson passed away on October 13, 2015 at her home She was a member of New Hope Missionary Baptist Church, Wilson. She is preceded in death by her husband R.B. Mosely Jr., mother and father Della Joyner and Joseph Bell Wallace, six brothers: Merl, Earl, James, John, Roy and Emmitt, seven sisters: Ila Dawes, Mamie Weaver, Bessie Joyner, Daisy Mosley, Etta Langley, Josephine Marlow and Nona Langley. She is survived by her daughter Ann and husband Spencer Manning of Wilson, three grandchildren Spencer Manning of Benson, Bobby Manning and wife Lori of Bailey and Nickie Warrick and husband Jay of Goldsboro, nine great grandchildren, several nieces and nephews. A Celebration of Life service will be held October 15, 2015 at 7 PM in the Chapel of Johnson Funerals and Cremations, 661 English Road, Rocky Mount with the Rev Steve Stephenson officiating. The family will receive friends at the funeral home from after the service until 9 PM . Graveside services will be at Evergreen Memorial Park, Friday, October 16, 11 am.